General Performance Index© (GPI: General Performance Index): "It is an index that measures the performance that a tennis player has had in a given period of time." This index, not shown here, is used to make the "General Performance Ranking© or GPI Ranking© ". This index considers, for its calculation, a series of aspects such as the number of matches played and won, the serves, the points earned with the serves, the returns, the break points (saved and won) and the tiebreaks. Once these indexes are calculated to certain period, January 2019 in this case, these indexes are ordered from highest to lowest and a ranking is established. This ranking is the General Performance Ranking© or GPI Ranking© that is used to order the players by merit of performance in January, in this case. As already it mentioned in other articles, the ATP Ranking necessarily not should coincide with the General Performance Ranking©, in fact, rarely happens. This General Performance Ranking© is very useful because it allows analyzing and quantifying what has been the performance of an athlete in relation to the other players that have played in the same period of time. As we have already mentioned in the report: “Top 150 of The Performance Ranking© – 2018 Season” regarding the performance of Alex de Minaur last season. 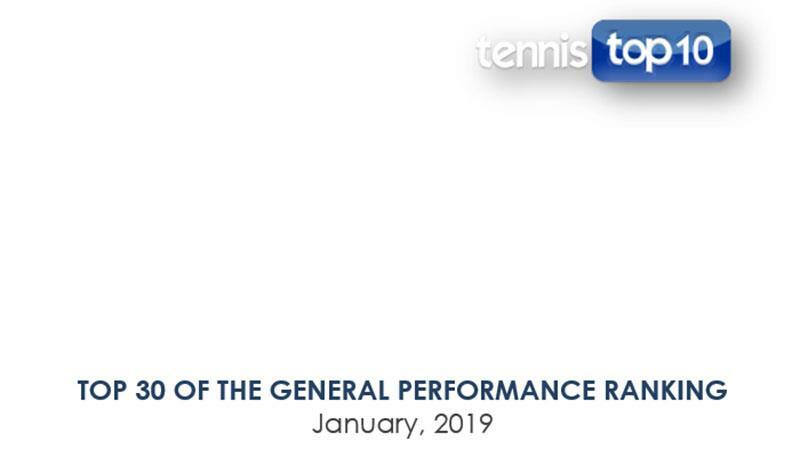 We had commented that Minaur had an excellent projection and, in the first month of the 2019 season, he confirmed this presumption by keeping the best performance in January, according to our statistical calculations. Table 1 shows General Performance Ranking© of the thirty (30) best players in the tournaments that began in the month of January. Generally, the players with the best GPI Ranking© are those who have played the greatest number of matches. This is because the formulas used to calculate the General Performance Index© or GPI© consider the number of matches played, that it assumes implicitly that if a player has played many matches in a short period of time under analysis is because he/she has had good performance, otherwise, he/she would have been eliminated in the preliminary rounds. That is to say, given a certain number of tournaments in which a player has participated, the performance index is higher if the player has won as many matches as possible. This comment must be considered when analyzing the tables because there are cases in which a player in a given aspect has a lower measure than another, but having more matches played the calculation of the index places him/her in a more advantageous position in the GPI Ranking©. We will mention it opportunely.